The Drowning Eyes marks the debut of a major new talent. Stop me if you've heard this one before: a young woman with too much money and not enough sense to keep her voice down attempts to hire a ship to take her away from an arranged marriage which she wants no part of. Fortunately for her, the crew she attempts to hire is honest and looks out for her in the bar. You haven't heard this one before because even though that's how The Drowning Eyes opens, that's not the story Emily Foster is telling. Shina, the young woman in question, is not who or what she claimed to be and though she's running, it's not from anything. In some ways, that's where the central conflict of The Drowning Eyes lies, because Shina's desperation to get to her destination is so overpowering that it causes suspicion with the crew and with the Captain. More, when the truth is revealed as to who Shina is, it is the Captain's mixture of acceptance and rejection that builds additional tension. The Drowning Eyes is a journey, it is life at sea, avoiding piracy, avoiding the Dragon Ships that have been raiding the coastline. It is survival, and it is about a glimmer of hope. It is also a glimmer of friendship crushed by heartbreak and loss. Oh, and there is amazing weather magic. Let's not forget the weather magic because it shapes the entire narrative, both in the quiet moments of the setting and the larger moments of extreme conflict. It shapes how the characters interact, the fear and prejudice of Captain Tazir, and aspects of the local economy. 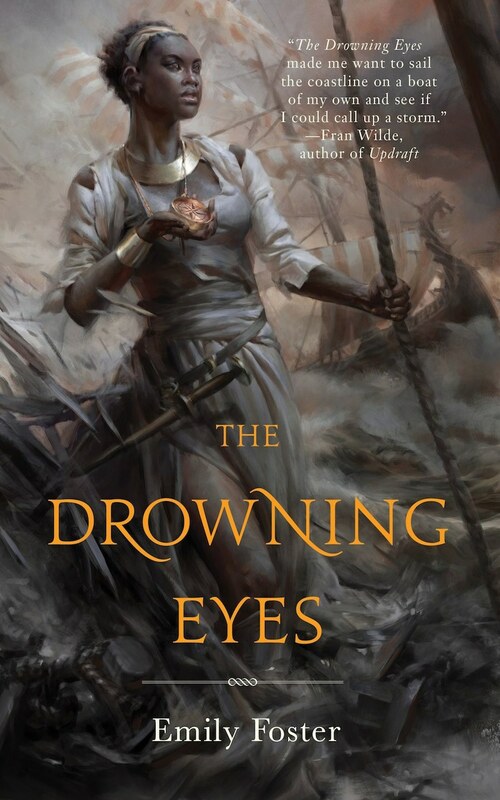 The Drowning Eyes is a stunningly good debut from Emily Foster. It is at turns tense and intense, and Shina's story is compelling and moving at all times. Just from this story alone, Emily Foster is a writer to watch. I can only hope that this is not the only story Emily Foster plans to tell in this setting. The Drowning Eyes is rich enough that on its own it could be expanded into a novel in order to tell more of the story, but it could also work as the first of hopefully many companion novellas telling different stories in this same world. I would also like to take a moment to point out the stunning cover art from Cynthia Sheppard. This has no bearing on the overall quality of Foster's novella, but damn is that some nice work. Penalties: -1 because I have no idea what the heck the Dragon Ships were all about.